(For references, see Part 5). The earliest printed mention of the giant Hickathrift occurs in a massive book by John Weever, entitled ‘Ancient Funerall Monuments’, dated to 16311. Weever reports a tradition of the Smeeth that once upon a time, a great conflict broke out between the inhabitants of the Seven Towns and their Landlord, over the rights and boundaries of the Smeeth, and the villagers were definitely getting the worst of the battle. At this time, Tom had got himself a job carting beer for a King’s Lynn brewer, and he often had to drive his cart over the Marshland to Wisbech. 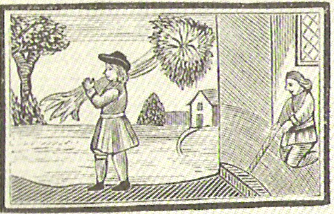 Along comes Tom to the scene of the battle and, in Weever’s words, “perceiving that his neighbours were faint-hearted, and ready to take flight, he shooke the Axell-tree from the cart, which he used instead of a sword, and tooke one of the cart-wheeles which he held as a buckler; with these weapons....he set upon the....adversaries of the Common, encouraged his neighbours to go forward, and fight valiantly in defence of their liberties; who being animated by his manly prowesse, they....chased the Landlord and his companie, to the utmost verge of the said Common; which from that time they have quietly enjoyed to this very day”. This chapbook relates how Tom used to drive his brewer’s cart between Lynn and Wisbech, but because of a fierce giant or ogre that dwelt in the Marshland, had to make a long detour around. One day Tom became fed up with this, and on his next journey resolved to test the ogre’s might. From his cave, the giant saw Tom coming and leapt out to meet the trespasser, saying “Do you not see how many heads hang upon yonder tree that have offended my law! But thy head shall hang higher than all the rest for an example”. To which Tom then gave the classic riposte “A turd in your teeth for your news, for you shall not find me like one of them”. The giant, enraged, dashed back into his cave for his gigantic club, while Tom up-ended his cart and took the axle and wheel for a sword and shield. With these weapons, and after a mighty battle, Tom beat the twelve-foot high ogre into the ground and sliced off his head. After this deed Tom became the hero of the Marshland, and was henceforth known to all as ‘Master’ Hickathrift (a formerly distinct title that lost its significance in the 17th century). These two alternate themes – the defeat of the Landlord and the slaying of the giant, both with wheel and axle – parallel one another until about the beginning of the 20th century, when the Landlord version is forgotten and only the giant-slaying remains. The problem is, which tradition came first, or were there from the very beginning two separate but very similar tales existing concurrently? From experience I would say that the former is the true problem, and that easily solvable. Although the 17th century Pepysian chapbook is the oldest extant, we can be fairly certain that there was an earlier original, probably of the 16th century – or at least the internal literary evidence seems to point that way. And of course the substance of the chapbook is derived from popular oral tradition of indeterminate age, as is the substance of the passage in Weever. But it is the process of folklore to embellish, to enlarge, and thus it is that the tyrant Landlord must have come first, to be enlarged and aggrandised in the popular mind and by the chapbook writers, catering to a less discerning audience than that held by such as John Weever. For the same reason the Landlord has vanished from current Hickathrift tradition, leaving only the wicked giant to be overcome by our hero. At this point Sir William Dugdale should be mentioned again, because of the curious role reversal that he creates in his 1662 work ‘The History of Imbanking...’.6 Dugdale somehow manages to twist the Weever story about, making Hickathrift himself into the zealous owner of the Smeeth common land, mightily defending himself with wheel and axle against the quarrelling villagers. This is a most peculiar reversal, and can only be explained by a hasty and inaccurate reading of the legend as told by Weever. Whilst the antiquarians have no more to say about Hickathrift’s exploits, the chapbooks on the other hand have a great deal more to tell. After his slaying of the Marshland ogre, Tom went into the cave and found there all the monster's ill-gotten hoard of gold and silver, enough to make him a rich man for life. “Tom took possession of the giant’s cave”, says the chapbook, “by consent of the whole company, and every one said he deserved twice as much more; Tom pulled down the cave, built him a fine house where the cave stood; and the ground that the giant kept by force and strength, some of which he gave to the poor for their common, the rest he made pastures of and divided the most part into tillage, to maintain him and his mother Jane Hickathrift”. He then made a deer park round about, and near his house built a church of St. James “because he killed the giant on that day....” (which at the time of writing was August 6th). Whether or not this part of the tale influenced the naming of the parish in 1923 I do not know, but perhaps it is significant that there has never been another church of St. James in the whole of the Fenland district. 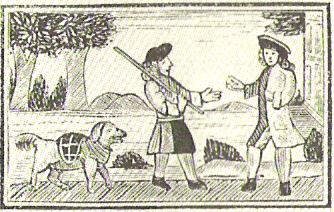 With his newfound wealth and respectability, Tom traveled far and wide throughout the Marshland, sometimes with his pack of hounds, to such festivities as “cudgel-play, bear-baiting, foot-ball, and the like”. One such event, although a minor one in the course of the story, will be seen to gain a greater significance later on. He rode one day to where some men were laying wagers upon a football game, but he was a stranger to them and not allowed to join in; “but Tom soon spoiled their sport; for he meeting the foot-ball, took it such a kick that they never found their ball more; they could see it fly, but whither none could tell....” The participants became angry at this, but Tom simply grabbed up a “great spar” from a ruined house, and flattened the lot of them. On his way home he encountered four armed robbers. Once more in summary fashion he slew two and wounded the others, taking £200 from them for his trouble. But he later came upon a stout tinker barring his path, and since neither would yield to the other, they battled with staves (reminiscent, of course, of the meeting between Robin Hood and Little John). They were evenly matched, until Tom threw down his staff, invited the tinker to his home, and they became the best of friends. At this point the earliest chapbook versions end, but later versions have a second part attached, obviously written by someone familiar with the original text, but equally clearly of a much later date. A typical example of this would be ‘A Pleasant and Delightful History of Thomas Hickathrift’, printed around 1750. Many others were produced all through the 18th and 19th centuries, but all apparently based on the text of this one. (Norwich Central Library had dated this particular chapbook to the 1600’s, but by study of the internal evidence I revised this to the mid-18th century, a revision that has been accepted). This continues the exploits of both Tom and the Tinker (whose name was given as Henry Nonsuch), telling how they were called to the Isle of Ely to help in putting down a rebellion. They defeated 10,000 (one reference says 2000) men all by themselves with naught but clubs as weapons; and when Tom’s club broke, he “seized upon a lusty, stout raw-boned miller, and made use of him for a weapon, till at length he cleared the field....” The King was so pleased with them that he promptly knighted Tom, and gave the Tinker a pension for life. As Sir Thomas Hickathrift, he then turned for home, only to find his aged mother dying. After this Tom’s thoughts were turned towards marriage, and he began to court a “rich young widow” of Cambridge named Sarah Gedyng. After trouncing a rival in love, Tom came up against two hired Troopers whom he simply tucked under his arms until, humiliated, they swore never to trouble anyone again. But even as Tom rode to his wedding, along came his rival with 21 hired ruffians to stop him – to no avail, for Tom just took up a sword and sliced an arm or a leg off every one, then hired a nearby farmer’s dung-cart to carry them home. An amusing and rather bizarre episode followed at his wedding feast, which was held in his own home. At the end of the proceedings he discovered a silver cup to be missing, which was presently found on an old woman named Strumbolow. While the other guests were all for chopping her to pieces for her theft, Tom devised a rather novel method of punishment: “He bored a hole through her nose, and tied a string thereto, then tied her hands behind her back, and ordered her to be stript naked, commanding the rest of the old women to stick a candle in her fundament, and then lead her by the nose through the streets and lanes of Cambridge, which comical sight caused a general laughter”. With no more ado he suffered the dragon likewise, then he and Henry the Tinker went out and dispatched the rest of the ravening beasts. But alas! The Tinker was slain by one of the lions. Tom then went home, but died in less than three weeks out of grief for his friend. And there the chapbooks end their tale. But the legends do not end, and more is added over the years, enlarging and twisting various episodes, until much is scarcely recognisable. Probably one of the earliest additions is related by H. J. Hillen in about 1891. 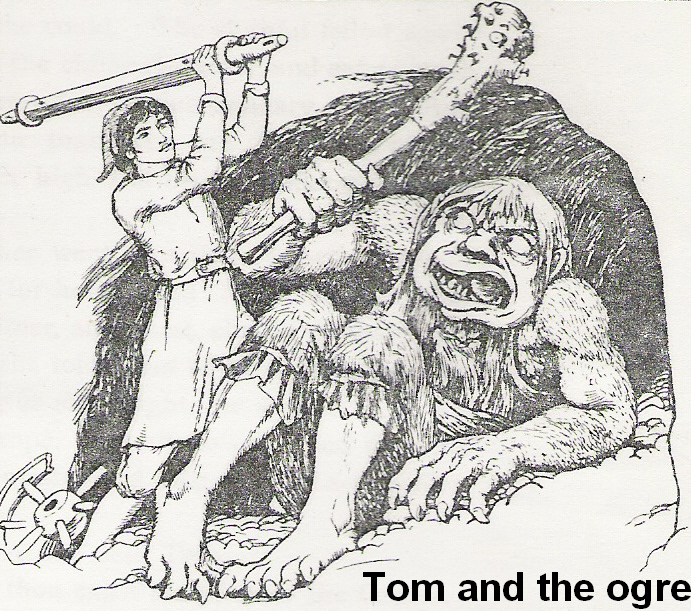 A local of the Smeeth told him that when Tom had slain the Marshland ogre, he decided to cut out the giant’s tongue. Then shortly after Tom had departed, along came a rogue who severed the head and took it to the King for a reward. Just as the King was about to open the royal purse, up popped Tom with the tongue and claimed the reward for himself. “The imperdant rarscal”, said the old local, “rushed scraamin’ away, getting’ a jolly sight more kicks than ha’pence!”8 This additional fragment is not original to the neighbourhood however, being simply a variant on the old folk-motif of ‘The False Claimant’.